Suburbicon is a disjointed mess of a feature film. It is a gonzo black comedy that never quite coalesces, but sustains itself with enough energy that it never completely falls apart. Suburbicon is a bizarre hybrid. Watching the movie, one gets a sense that the film has been stitched together from two core stories. Indeed, this was very much the case; the central plot of Suburbicon was original written by the Coen Brothers as a grotesque comedy of murder and mayhem, while the movie’s prominent subplot was grafted on later by director George Clooney and collaborator Grant Heslov to add a sense of social realism to this late fifties Americana. These two elements never quite cohere, which means Suburbicon never feels truly focused. There is a telling moment around half-way through the film, when an insurance investigator has stopped by the family residence at the heart of the story. Investigating a suspicious claim, the gentleman is clearly fishing. “In the end,” he reflects philosophically, “it all comes down to one word.” Without any elaboration, he allows his mind to wonder and the conversation to drift. He only returns to that train of thought when guided by his interviewee. “What is it?” they ask. He is lost. “What?” They clarify, “The word?” The investigator takes a moment to get back on track. That small conversational aside captures what is most appealing and most infuriating about Suburbicon, a movie that lacks a strong core and finds itself caught between two very different stories without any strong focus on either. Suburbicon is never boring, packed with strange turns and driven by a pitch black sense of humour. However, it never seems entire sure of what it is. Money Monster works better as a heightened thriller than as righteous social commentary. There is a lot to recommend Money Monster, beginning with the basic premise. Lee Gates is the fast-talking abrasive host of a hyper-masculine financial television show, who finds one Friday afternoon broadcast hijacked by a disgruntled investor who followed his advice. Tensions quickly escalate, as Gates finds himself trying to stay alive while also unravelling a thread of conspiracy and deceit that seems to tie the financial markets together. Gates and his assailant find themselves part of an unlikely team-up to blow this corruption wide open. Money Monster hinges on the combination of Jodie Foster’s direction and the cast’s charm. George Clooney remains one of the most charismatic performers on the planet, and there is a reason that Julia Roberts was one of the most successful lead actors of the nineties. While Clooney and Roberts add star power to the film, Foster benefits from casting Jack O’Connell as the irate-investor-turned-would-be-suicide-bomber. While performers like Dominic West and Giancarlo Esposito are horribly underused, they do add gravity to the film. Jodie Foster is smart enough to keep the film moving. Even as a high-concept thriller, Money Monster is absurd. The characters frequently act irrationally. The plot never feels like an organic series of rippling consequences, with the author’s hand consistently visible. It is a movie that hinges on contrivance, with Foster working very hard to prevent the audience from catching their breath long enough to question the logic of what is unfolding on-screen. In some respects then, it has more in common with the world of high finance than it would care to admit. If you tried to take an Indiana Jones film and turn it into a meditation on the scale and conflict of the Second World War, you would end up with The Monuments Men. That is to say, if you sucked all the fun out of it while trying to balance a pulpy tone with a more weighty reflection on the cultural responsibilities that came with winning the Second World War. The movie is just as tone deaf and ill-judged as that description seems to imply – having a lot of clever things to say, but never being quite sure how to say them. 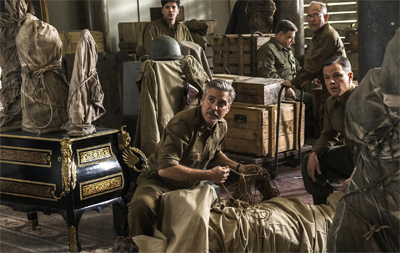 There is a good film to be found in The Monuments Men, if one looks hard enough. One can imagine writer, director and actor George Clooney chipping away at the story trying to find that good movie, like one of those artists whose work was rescued by this band of merry men. You get a sense that Clooney can see the angel in here somewhere; he’s just not sure how to set it free. Warners have released another trailer for the film, and it looks – as one might expect from Alfonso Cuaron – absolutely stunning. Check it out below. Warner Brothers just released the teaser trailer for Gravity, from director Alfonso Cuarón. Cuarón has developed his own unique sensibilities. He’s responsible for the most visually distinctive of the Harry potter films, Harry Potter and the Prisoner of Azkaban, and produced and underrated and oft-overlooked science-fiction masterpiece with Children of Men. I am very eager to see Gravity, which looks to be a rather wonderful change of pace. It’s interesting to look back at George Clooney’s early road to movie stardom. Indeed, the actor’s first leading roles seem like movies that really should have been star-making turns, but just weren’t. There’s obviously his portrayal of Bruce Wayne in Batman & Robin, a performance not quite as bad as the film around it, but there’s also his roles in films like The Peacemaker. The Peacemaker also was the first film released under Spielberg’s Dreamworks company, and it’s hardly an auspicious début. It’s not that The Peacemaker is a bad film. It’s a very well made, and the production values are excellent. However, the problem is the premise itself, the plotting, the pacing and the script. The Peacemaker feels like it really wants to be a Tom Clancy thriller, and it really wants us to accept George Clooney as a more dynamic Harrison Ford. Unfortunately, it feels like all the plot points, characters and motivations all came second-hand. There isn’t one thing here that hasn’t been done before, and done better, and those parts aren’t even assembled in an especially original way. The name’s Clooney. George Clooney.